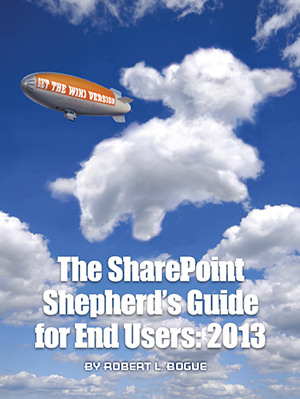 The SharePoint Shepherd’s Guide for End Users: 2013 is an essential tool to enable you to maximize the value of SharePoint and build exciting functionality. Providing detailed examples, this guide will be the best SharePoint resource for end users pursuing real value for your organization. This 2013 SharePoint guide includes more than 120 easy-to-follow lessons with clear directions, tested advice, and helpful screenshots. They are proven to help end users take advantage of everything SharePoint has to offer for productivity and efficiency. If I only have to do this process twice a year, how am I going to find this spot again? With step-by-step guidance for the tasks you do most, you’ll never have to worry about remember how to create a list, add a field, add a user to a group, or many other SharePoint features. The book contains a detailed outline and index where you’ll find the SharePoint help you need simply by knowing what you want to get done. Unlike most end user books which cover just the essential tasks, this book will help you take advantage of the many productivity – and efficiency-driving benefits that SharePoint 2013 offers. With flowchart-style decision trees and supporting descriptions, you’ll be lead through the common questions that users have – like what template to use when creating a site, and whether you should use active directory or SharePoint groups to manage security. You can use the website shopping cart and also get a Kindle version at Amazon.com.